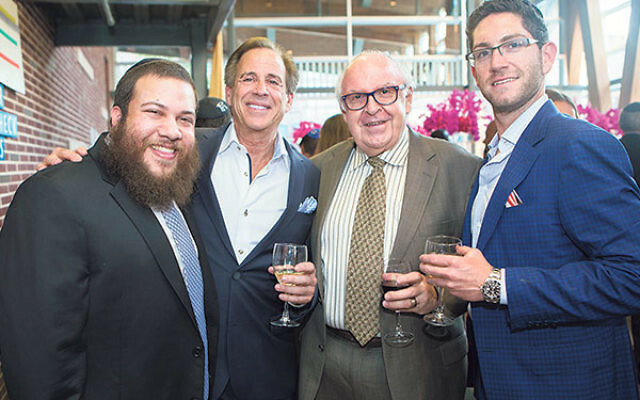 Enjoying the Hand in Hand tribute dinner are, from left, Rabbi Yaakov Greenberg of Long Branch, Jeff Acker of West End, Phil Kramer of Marlboro, and Rob Putterman of Colts Neck. 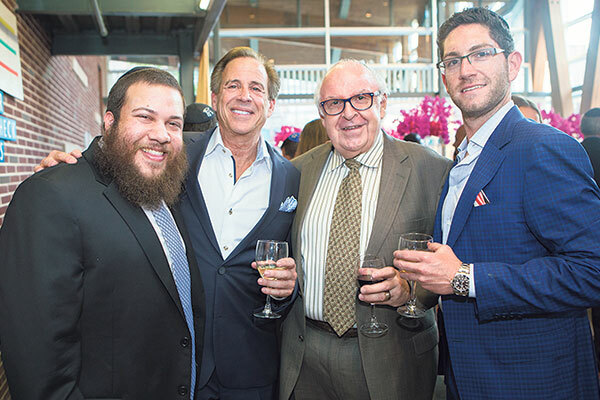 Honoring its corps of teenage volunteers and Joan and Bob Rechnitz of Red Bank for their continuing support as major donors, Hand in Hand held its annual tribute dinner at the Two River Theater in Red Bank — which the Rechnitzes founded — in late June. Hand in Hand, a program of Chabad of the Shore, recruits teen volunteers to work with children with special needs and offers recreational and outreach programs for those children and their families. “It is inspiring to see the amazing effect these teenagers have on the children — serving as mentors, role models, and best of pals,” said Bob Rechnitz. At the event, Sharon Betesh of West Long Branch spoke about her experience as a volunteer. She and fellow volunteer Gabrielle Franco of Oakhurst make weekly visits to Hannah, a 17-year-old with special needs. “I was so eager to get to know Hannah, but I did not fully comprehend the impact she and her family would have on my life,” said Sharon. The event featured entertainment by speed painter Dan Dunn.